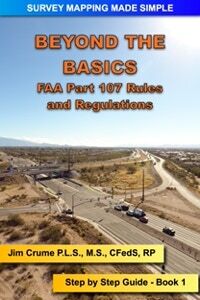 The following is a suggested study guideline for the new Part 107 Remote Pilot starting out in Survey Mapping that utilizes the Drone Books that are available on this website. Start with Book 1 - Beyond the Basics. 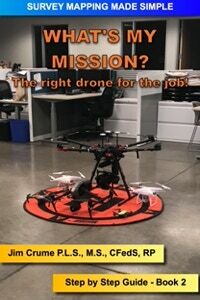 Now that you have your Part 107 certification and a drone, build upon that by taking your knowledge and skill set to the next level for Survey Mapping. 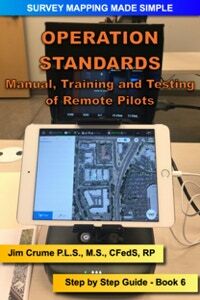 A thorough understanding of the National Airspace System, Waivers and Airspace Authorization, Local drone laws, NOTAMS, METARS, Coordinated Universal Time, Urban and Rural environment, Drones and the Public, Flight logs, Checklists is required to be a master at Survey Mapping. Next: Book 2 - What’s My Mission?. There are two basic types of drones, Fixed Wing and Rotary Wing. Which type of drone is best for your project will depend on several factors such as the size of the project, the location of the project, the Ground Sample Distance requirements, camera/sensor options and project budget. For large project sites, an aerial company with a manned aircraft might be the better option. Next: Book 3 - Time to Fly. Mission planning starts with the project size, location and controlled airspace restrictions. Picking the right drone for the mission is critical to controlling the camera FOV, image Neat Area, airspeed of the drone, front/side image overlap. GCPs are required in order to process the imagery correctly. Picking the mission planning software is key as well. Meeting the ASPRS Mapping Standards for a particular GSD is a primary factor when selecting a camera/sensor that will be utilized. Next: Book 4 - Deliverables. 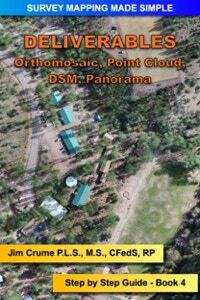 There are many deliverables that can be created from drone survey mapping imagery such as Orthomosaic, 3D Point Cloud, DSM, DTM, Volumes, Panoramas and Contours. The level of accuracy will depend on the camera/sensor mounted on the drone. Not all camera/sensors are created equal. GCPs are required in order to rectify the imagery correctly. Next: Book 5 - Emergencies. This book discusses the difference between Accidents and Emergencies. 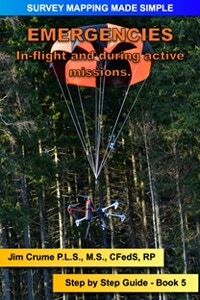 It covers Spatial Awareness, Visual Line of Sight, Flight Planning, Risk Mitigation, RTH features, when to abort a mission, Emergency Landings and Drone recovery. As the Pilot in Command, it is your responsibility to conduct a safe flight, avoid accidents, injury to people or property and to take appropriate action during an emergency. Next: Book 6 - Operation Standards. If you are a one person operation or you have several pilots operating UAVs in your organization, a Standard Operation Manual is a must. It provides the necessary details for day to day remote pilot operations. Insurance companies will require a Standard Operation Manual, pilot training and testing. Fleet management and logbooks are part of the daily requirements for a successful drone operation. Next: Book 7 - Static - Fast Static. 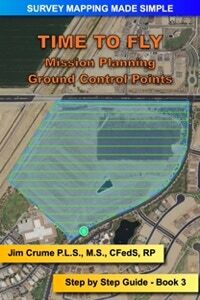 For all survey mapping operations, Ground Control Points are going to be needed. If you have an RTK unit on your drone you still need GCPs for quality control assurance. Using Fast Static (Rapid Static) is a viable solution for establishing higher order GCPs. 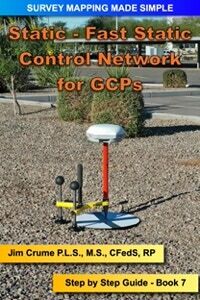 Using survey grade RTK is what most survey companies use on a daily basis for establishing GCPs. Fast Static will increase the accuracy by 1 to 2 cm vs RTK. Next: Book 8 - Litchi. Take your flight management to the next level by having complete control from takeoff, flight speed and landing. 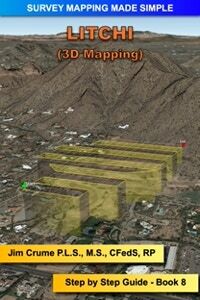 Automated flight management apps work really well for most operations however you loose control of several elements of the flight such as speed of the drone and image capture rate. Using Litchi will give you complete control of the entire flight.